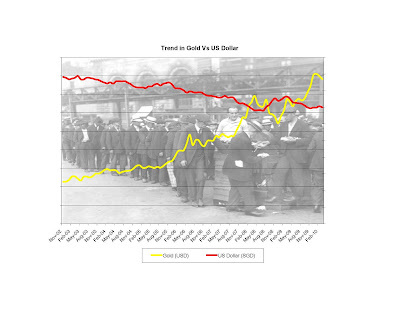 This week's chart: A plot of gold prices versus the US Dollar from 2002 through 2010. Click the image for a larger view. Gold is a traditional hedge against inflation. A "loose" monetary policy is a central bank strategy of increasing the money supply over time to sustain employment and output levels, but not so much that runaway inflation destroys wealth. A sustained increase in gold prices vis-a-vis the dollar indicates that, over time, investors are worried about erosion in value of dollar denominated assets. Obama's pick for the Federal Reserve Board's #2 spot, Dr. Janet Yellen, is widely believed to be a "dove" on inflation, which means that she believes employment and output are at least as important as controlling inflation when setting monetary policy. I'm not a goldbug, but I do have a nice collection of rare coins and other hard assets, whose value trends similar to gold.